November 16 2016 is an important date for the Swedish and Norwegian public safety agencies because it marks the creation of the world’s first shared international TETRA network. It is the result of years of work to resolve technical challenges in connecting Motorola Solutions (Norway) and Airbus Defence and Space (Sweden) TETRA networks, and an even larger set of challenges regarding the common working of police, ambulance, and fire services in the two countries. Sweden and Norway share a 16,000 kilometre border – the longest in Europe – with six major road crossings and four rail crossings. They speak different but similar languages and in the border areas officers can generally communicate effectively with their neighbours. But working procedures and policies are another matter, and it was here that much work needed to be done. One example would be which agency takes the lead in a major incident – in Norway it’s the police but in Sweden it is the fire service. One common threat that involves multiple agencies is forest fires, and these can occur in Winter as well as Summer. In Norway the management of a major fire will sit with the police control room as the fire service does not have facilities for managing large events. Forest fires are also a complicated threat because they can easily cross the border with Sweden. In extreme, unusual or complex emergencies the army may be deployed. A Norwegian police officer explained that the army has several thousand TETRA terminals and is sometimes called in to assist with emergencies. They train together for certain types of emergencies. Tor Helge Lyngstøl is director general of the Directorate for Emergency Communication (DNK), the agency that operates Norway’s TETRA network for the emergency services. “We took time at the beginning to understand which were the most fundamental user requirements, and then prioritised these as we had to be realistic,” he says. “The two manufacturers, Motorola Solutions and Airbus, were involved at an early stage to make sure we defined a doable project with a sufficiently narrow scope. So we began the programme with a clear understanding of the deliverables,” Helge Lyngstøl explains. “The manufacturers worked well together with senior commitment. In Norway this was a very large contract for Motorola Solutions and so it received commitment right up to the CEO. My impression is that the Swedish were in equal contact with their system supplier. “The users commented on what could be delivered, some adjustments were made, and the end users got on board and have worked with great enthusiasm on the project across borders and organisations, and many have become friends. This is also true for the project teams in the two countries. Good working relationships are not a hard deliverable but will certainly contribute to effective working in real emergencies,” he concludes. Connectivity between the Swedish and Norwegian TETRA networks. The capability for officers to use their TETRA terminals in either country. A set of talk groups to connect officers from both countries, these are named NOSE (NOrway SwEden) groups with F, H or P added to designate which agency is to use them. In addition there are co-operation groups for inter-agency communications. Common working procedures for officers in both countries together with a training programme. Control room interconnection across the border. To test and demonstrate the capabilities of the shared network more than 350 members of the emergency services, together with members of the public as ‘victims’, from both countries were involved in practice incidents. The exercise serves two purposes; firstly to train a number of officers from both countries in using their TETRA radios across the border using the co-operation talk groups and new procedures. Secondly to demonstrate the system’s capability to visitors from Scandinavia and other countries as well as local and international media. After viewing the main part of the exercise visitors were taken to a nearby conference centre to witness the signing of the completion agreement. The exercise location was chosen to be just a few kilometres inside the border on the Norwegian side, on the E14 which runs from Trondheim in Norway east into Sweden. This is a main road but as it only has two lanes it reflects the relative remoteness of this border region. The scenario was a car theft in Trondheim with the thief fleeing over the border into Sweden. Meanwhile a collision between two coaches happens on the E14, with one coach on its side and significant casualties. The exercise was designed to escalate as new information came in from officers arriving at the crash scene. All three Norwegian public safety agencies were alerted and controlled the situation from the command centre in Trondheim. As the scale of the emergency became clearer assistance from nearby Swedish officers was requested. These Swedish units were able to fully communicate with the Norwegian officers on common talk groups, as well as coming under the control of the local commander on their arrival. In the demonstration area TETRA communications were coming through on the radios of both Norwegian and Swedish officers. A small emergency shelter was erected to treat the most seriously injured before they could be evacuated, some of whom were moaning and screaming very realistically! 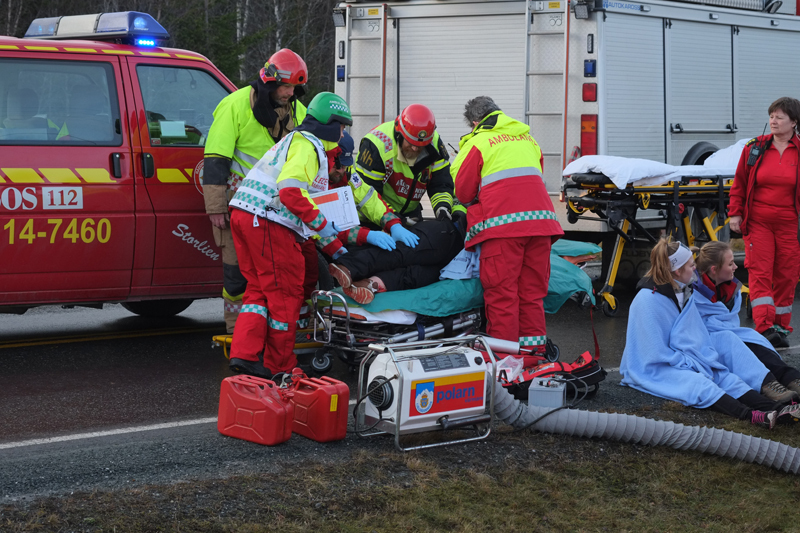 Two air ambulances from Norway flew in to collect the most seriously injured. This particular exercise showed the benefit of also having TETRA equipment in the air. However, fitting airborne TETRA radios is a major task and differs between helicopter types. A small drone was flown over the scene to provide good views for visitors, and although not part of the emergency team it clearly showed the potential benefits of having such a capability. The drone and its operator are often called to assist with mountain rescues in that area. The exercise continued into the afternoon with police finally hunting down the stolen car in Sweden. A main feature of the day was the formal agreement between the two countries to put the system into full operational use, signed by the directors of the Norwegian and Swedish operators; Tor Helge Lyngstøl from DNK and Helena Lindberg from the Swedish Civil Contingencies Agency (MSB). The (now former) Norwegian minister of justice and public security Anders Anundsen and the Swedish minister for home affairs Anders Ygeman signed the bilateral agreement and presented their views on the programme. They noted that this is the first direct TETRA communication system between two countries, which is a great step forward in safety and security. Radios from either country can now be used in the other, with cross-border talk groups. This drives more efficient use of resources for both countries. As Ygeman put it: “When citizens are at their weakest public safety organisations need to be at their strongest”. Malcolm Quelch, vice chairman of the TETRA and Critical Communications Association (TCCA), attended the event and passed on the organisation’s views. The TCCA fully supported this project and applauds the achievement of its completion. TETRA remains a vital communication system for public safety, and the TCCA looks forward to seeing more cross-border working. National security concerns make projects such as this a major challenge but clearly these issues can be overcome. The standardised interface developed will become important for TETRA to LTE connections in the future. The Association also supports the ETSI 3GPP programme and is active in developing standards for mission-critical LTE. It was grateful to the hosts for the excellent arrangements at this Norwegian event. The EU ISITEP programme in now complete and with Sweden and Norway’s experience any countries planning cross-border communications have a wealth of information available to learn from. Finland has formally requested to join the Swedish/Norwegian system. Representatives from Belgium, The Netherlands and Luxembourg (known as the Benelux countries) attended the exercise and engaged in detailed discussions with the Scandinavian teams. But progress with interoperability in the Benelux countries will depend on financial and political backing, which has not been easy to obtain so far. That’s not to say that cross-border communications don’t exist, for example the Netherlands and Germany have procedures for dealing with pursuits on the roads that cross the border, but the capabilities seen in Norway and Sweden are some way off.